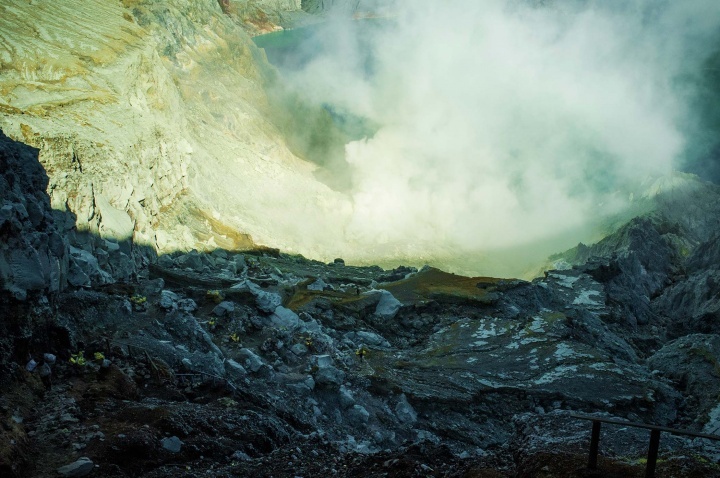 Ijen is an active volcano in East Java and home to a controversial mining industry. 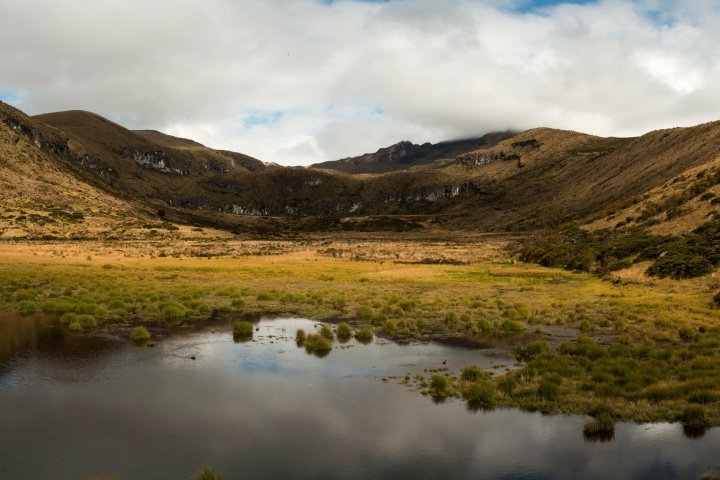 Three major eruptions, some 3500 years ago, created a caldera of 20 kilometres. 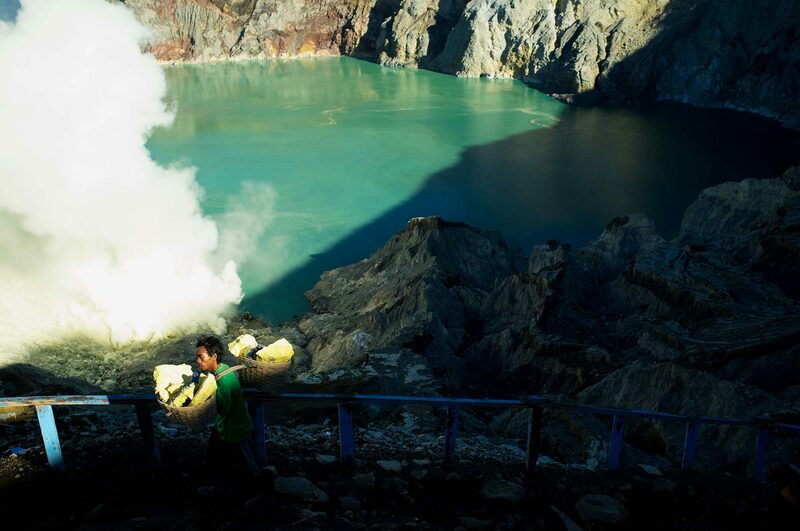 Standing at a height of 2800 meters, Ijen rose to international fame for having the world's most sulphuric acid lake. 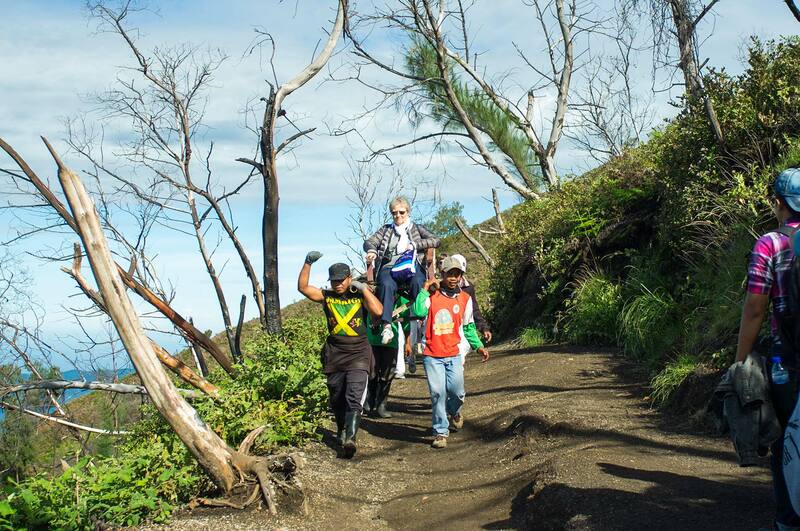 Each day local miners trek up the volcano’s steep slopes and down into the crater to mine for sulphur. This chemical element, which makes its way into a multitude of the world’s products is emitted from the volcano vents next to the crater lake. You can find this volcanic excrement in anything from the makeup you put on your face to the matches in your kitchen and the fertilizer you put on your lawn. It whitens the sugar in your tea, helps launch your New Year fireworks into the sky, and cleans your clothes. It fills the army’s guns, the batteries in your car and TV remote control. Ijen volcano's crater lake in eastern Java, Indonesia. The mine is located next to the lake, alongside the sulphur vents. 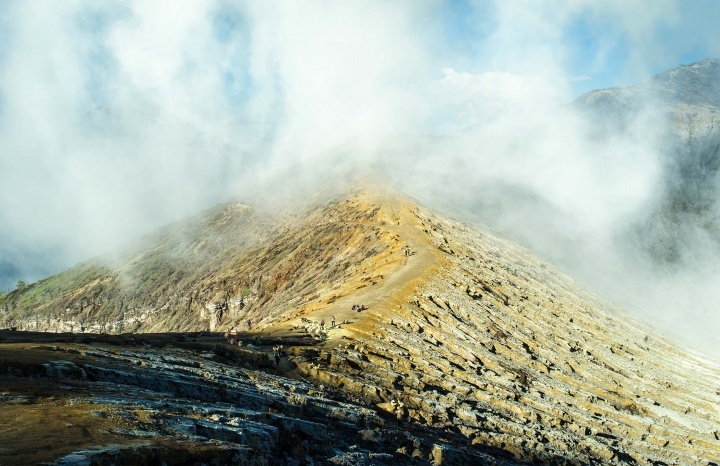 Ijen is one of only a few volcanic sulphur mines in the world where the sulphur extraction takes place in the life threatening location of an active volcano. My curiosity about Ijen was first piqued after watching the silent movie Samsara in 2011. The film shows scenes of men carrying baskets of sulphur over jagged slopes while surrounded by yellow smoke clouds. The bright colours of the yellow sulphur, the brown workers and the green crater lake etched an image of hard labour onto my memory. I was left wondering if that environment and that work could be reality or if the scene had been edited to look that way. A few years later what had once seemed doubtful was sadly confirmed as a reality. Overnight base for the workers who live at the mine while they work, they leave and rejoin their families at the end of the week. They work, cook and sleep here. I arrived at the volcano at 2am, parked my scooter and went to buy a protective face mask from a nearby stall. The area was like a camp, with a bamboo stall adjoining a house for the miners. The stall sold all sorts of essentials; from exorbitantly priced respirators and flashlights to water and chocolate. My only purchase was a face scarf to supposedly protect me from the volcanic smoke. As the camp was already full of people with lamps it seemed pointless for me to buy one, especially as I already had my phone torch. While travelling I try to save money on everything, therefore I always barter for rentals and other purchases. Food prices were low and it was possible to check the price of other goods by seeing how much others paid for the same thing. I bartered because of my reluctance to pay the unfair prices set for foreigners. I was extremely annoyed at being taken for an inexperienced fool who was easy to cheat. When this happens I would rather leave than buy something at the unfair price offered, at this point the seller usually drops his price. In many Asian countries the absence of price labels on goods means that the seller plucks a figure out of the air, if you’re not a local, get ready to pay more or barter. After paying the entrance fee and passing through the gates I started to follow a miner carrying a flashlight and empty yoked wicker baskets. He rapidly overtook a noisy crowd of slow walking people, passing them without stopping or breaking his pace. The tourists, like me, lumbered along clumsily, waddling like bears. It had been several months since my last trek so my legs were out of practice, this and the miner’s blistering pace meant that I had to push to keep up. I stayed close enough to see his light on the road but far enough back to stay hidden. As he walked his light focused sharply on the road, only occasionally disappearing into the abyss. Alas, my attempt to go unnoticed was foolish. “You should use a flashlight“, the miner said in broken English and turned to hand me a head torch. “The road is narrow, you could fall.” At that moment in time I had no idea how high up we were or where I could fall. Thanking him I put the head torch on and looked around me. It became apparent that for several minutes we had been walking along a road no more than two meters wide, with a sheer drop on the right. I edged closer to estimate how high up we were, but saw nothing except the lights from distant villages. The light from my head torch trickled down and dissolved into the darkness. The night was cloudy and the moonlight wasn’t able to illuminate the surrounding landscape. I realised that without the light he had given me I would have disappeared into oblivion. The most surprising thing was that on the way I saw some miners walking in total darkness, without any lights, as if they knew the way by heart. Miner with head torch and respirator. The rest station in the early morning. We reached the first rest station and stopped for a break. The rest station is located a mile from the miners’ base camp and the same distance from the mine crater. On the steps outside the hut at the rest station German, Polish and Indonesian tourists were eating their snacks, moaning and massaging their tired legs. The Polish tourists were complaining about the road, which they hadn’t expected to be so steep. One tourist even turned back. Chuckling to himself, the miner lit a cigarette, picked up his baskets and gestured for us to continue. This is how the road we walked along at night looked in the daylight. As we approached the top of the crater I felt the wind change dramatically as I was hit in the face by the acrid sulphurous smoke. Such a smell I had never experienced in my life. It was like the pungent odour of rotten eggs decomposing in the hot sun. However, the unbearable smell and its bitter sharpness was not the worst thing. When I inhaled it seemed to burn my throat and lungs, causing me to cough, almost to the point of sickness. It penetrated through my eyelashes, working it’s way into to my eyes. When I realised that my scarf wasn’t enough to protect me, the miner handed me a respirator, as if he had read my mind. I thought to myself – first the the light, now the respirator, as I looked around and down into the crater at the blue lights. “It’s very high“, the miner smiled and added “a lot of people died here, be careful“. I had read about the deaths of local miners on a steep slope here and the conditions in which they worked. “Follow me“, he added, starting his ascent into the abyss of the dead. “I’ll show you the blue lights“. 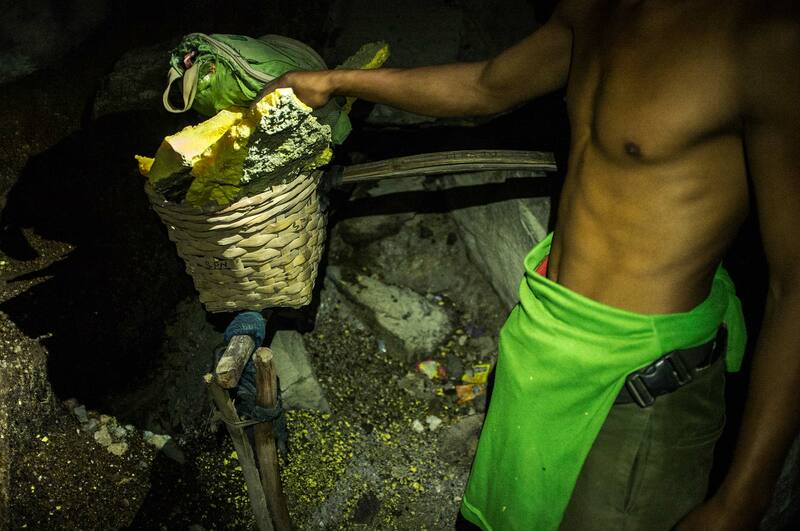 Sulphur - this is what leads hundreds of miners to Ijen everyday. 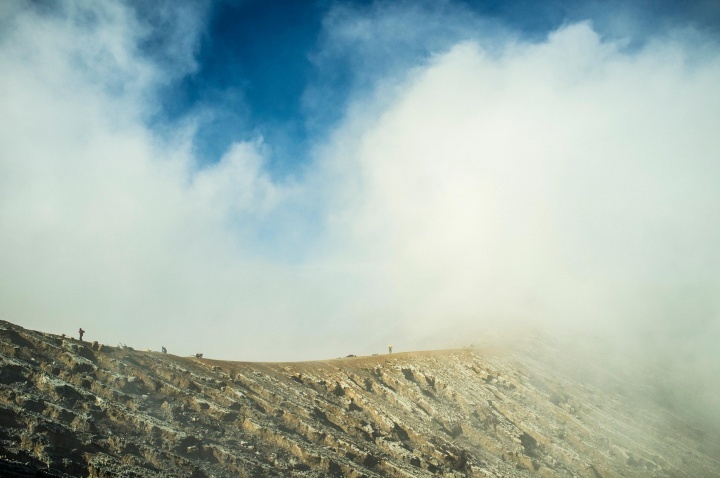 They leave their base camp to make the three kilometre climb to the top of the caldera before descending into the crater and repeating the journey in the opposite direction, risking life and limb. They make their way into the bowels of the volcano in search of this precious material, braving both the burning heat and the thin air. The blue glow is achieved through the combustion of sulphur dioxide, creating a dazzling spectacle especially after dark. To see this natural phenomenon, adventurous tourists hire local guides and trek up the volcano at night. 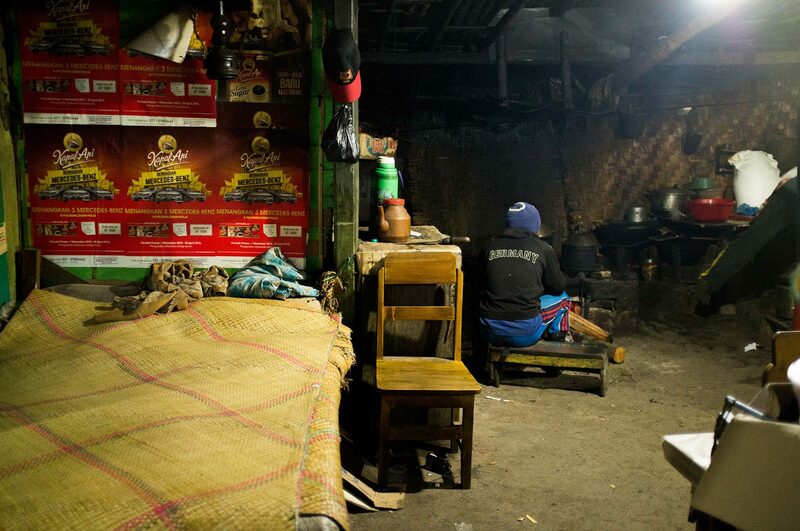 “Despite the darkness, I like to work at night“, explained Slamet, “it’s cooler and there are fewer people“. But it’s black as the devil, I thought to myself. “The mine has no set shifts and the workers are free to decide when they work“, he said. Due to the intense heat, some miners prefer to work at night, whereas others dislike the lack of light and prefer to work in the day. “Day work is very hot, at night only the blue light is visible“, he said, “tourists come for it“. Slamet looked at me, hinting that I was one of those tourists. Ijen emits bright blue flames, similar to the ones that come out of a gas burning stove. Following the publication of a series of photos of “electric – blue flames” in National Geographic, by French photographer Olivier Grunewald, tens of thousands of tourists started to flock here every year. They visit at night to catch a glimpse of the famous blue light — incandescent and up to 600°C in temperature, the sulphuric gas escapes at high pressure through cracks in the crater and ignites when it meets the air. The flames can reach up to five metres in height and are visible from a kilometre away, some people don’t even need to descend into the crater to take pictures of it. To prevent the place from blowing up, the flames have to be constantly extinguished by one of the workers. 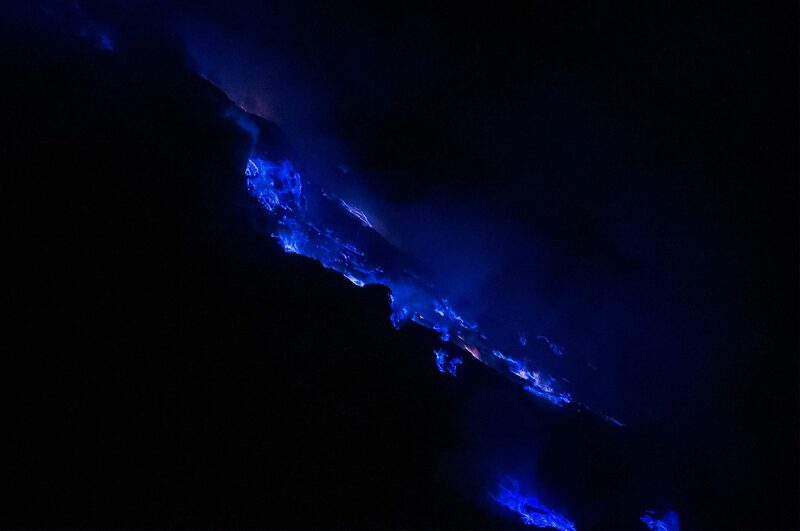 Blue fire – is an ancient phenomenon, but prior to being featured in a publication and made famous, night hiking up a volcano to see it was not a tourist attraction. Tourism started to bring a lot of money into the local coffers and continues to develop through the opening of hotels, travel agencies and the like. Balinese travel agencies offer straightforwardly named tour packages such as: “Amazing electric-blue volcano lights” or “Incredible unearthly blue lights”. On the walls of local warehouses and factories around Ijen the slogan “I love Banyuwangi” is graffitied and miners are given hoodies emblazoned with the same words, turning them into a walking advertisement for the town and creating the mask of a “happy worker”. Some workers begin to take on the role of tour guide, speaking a little English, offering you the extra flashlight or mask that they happen to be carrying in reserve, showing you some features of the area, advising you on what to do and what not to do. They might bring the tourists down to the crater, taking pictures of them with the lights in the background. On the way back up they will willingly pose for the tourists, smiling for the camera and asking for a little money in return or offering them some small trinkets made of sulphur as a souvenir. It’s clear that those miners working at night, and able to speak a little English, saw and seized the opportunity to earn some extra money by offering flashlights and masks to tourists. In addition to their measly earnings from the mine they can always play up to the camera to soften the tourists and beg 20,000 Rupiah or so (a few dollars) for the pleasure. All of this is reminiscent of a bear on a bicycle doing tricks in exchange for candy. As Robert Schrader noted on his blog: “I couldn’t help but notice the extent to which other tourists seemed to be taking delight in their dangerous working conditions. Each grief-arazzo would offer a particular miner cash or cigarettes in exchange for humorous poses. Or, if he was extremely lucky, the chance to try and balance a heavy load of putrid sulfur on his own shoulder for just long enough to have his picture snapped“. Porters carry an elderly woman “enthroned” on a sedan chair three kilometres uphill. At dawn, the tourists took their final photos before making their way back down the volcano. At about 8am sedan chair “slaves”, similar to those I had seen in Huangshan, China started to appear. These porters offer carriage up the volcano to those want to visit but either can’t walk up or can’t be bothered to walk up themselves. Some might see the use of this service as keeping local people employed, however I see this only as the exploitation of people as “slaves”. In the words of George Orwell “All animals are equal but some are more equal than others“. A tourist in elephant pants asks a miner about working conditions. It’s interesting to observe the joining together of so-called “modern slavery” and a cultural form of neo-colonialist hegemony. When combined these two concepts are transformed into modern tourism – a form of entertainment for wealthy foreigners, representatives of a privileged class who demonstrate their status by taking a break in the same place as locals are suffering on the edge of survival. In the case of the sulphur mine, such tourists descend into the crater for fun and take pictures of themselves in front of the blue lights, all the while they are surrounded by people trying to earn their daily crust by doing a back-breaking and life threatening job. A tourist is an ugly human being. He is a person visiting heaps of death and ruin and feeling alive and inspired at the sight of it. View from the top of the mine shaft. It's only 300 meters from the top but a 1 km walk to the edge of the crater lake. Despite making additional earnings as a result of “blue fire” tourism, conditions for workers at the mine haven’t changed much since its opening in 1968. The ramshackle road is rocky and the stairs are cut from the same sulphuric stone found in the crater, wooden railings line one side of the path only sporadically. 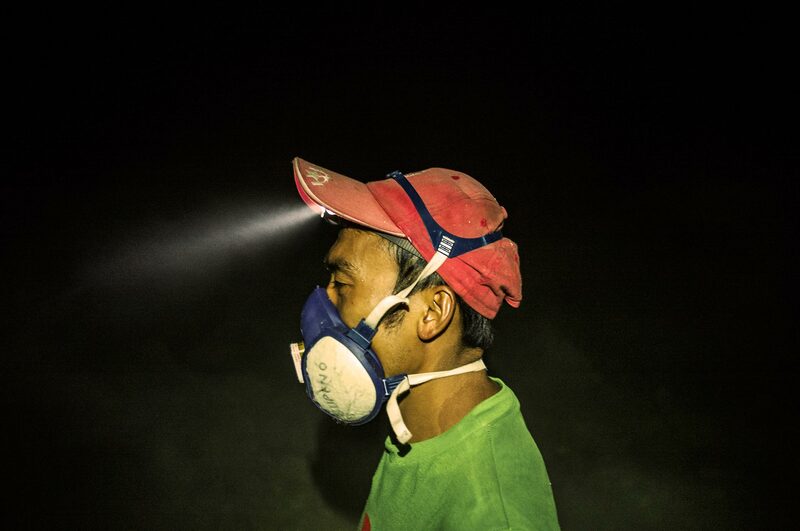 The miners work with head torches and a minimum amount of protective gear, instead still using traditional equipment. Metal rods are used to break the sulphur plates, flashlights replace the traditional flaming torches but very few people wear masks or boots, instead they use rubber slippers and stuff wet rags into their mouths. This is all a rather futile attempt to protect themselves against the putrid gas, rocky terrain and threat of burns. Smoke envelops the crater ridge. “Go and see how it’s done“, my coughing guide said, while pointing me towards a curtain of smoke. All around me was the deafening and incessant sound of hacking coughs, as if I was in a room full of tuberculosis sufferers. Passing through the curtain of smoke I saw another miner, he struck the ground with his iron rod and soon after a red liquid, like watery blood, flowed out. In one hand he held the metal rod, while the other hand covered his mouth as he coughed and periodically spat phlegm onto the ground. It was like the miner was coughing his lungs to pieces. I wasn’t surprised, even through the filter of my respirator the sulphuric odour still managed to seep through, eerily caressing the back of my throat. Miner engulfed in smoke hammers the floor and picks up the pieces of sulphur. As the wind shifted course the workers were repeatedly concealed behind a thick plume of toxic smoke. The sinister tranquility of the mine was due precisely to the presence of this smokescreen rising up and engulfing everything around it, from the starry sky to the surrounding sounds. It could easily be mistaken for innocent steam rather than a highly concentrated cocktail of hydrogen sulphide and sulphur dioxide, which burns at the eyes, throat and lungs and dissolves the teeth. Over the last forty years, work related injuries have resulted in the deaths of some 70 miners, in many cases they have been suffering from the devastating effects of the sulphur gases. A miner balancing baskets of sulphur on his shoulders. Down in the crater the miners work as quickly as possible to minimise their time spent in these dreadful conditions. 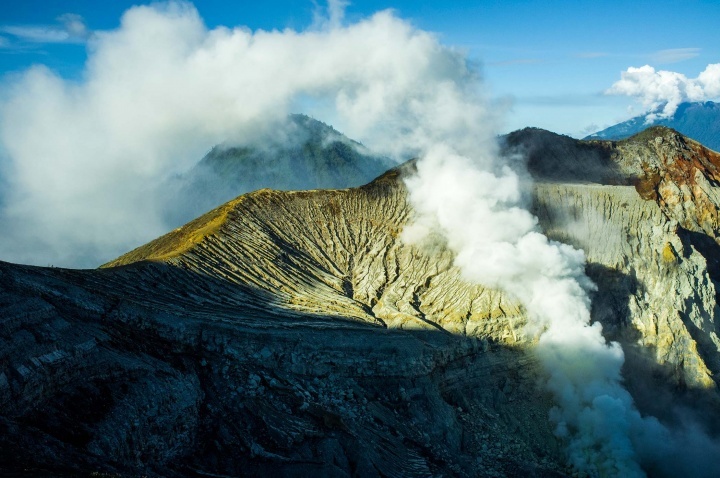 They work directly at the source where the yellow mineral is formed, the fumaroles (volcanic vents) are capped with ceramic pipes through which the volcanic vapours flow before cooling, condensing and then hardening. The solid sulphur can take many forms; from roughly hewn crystals to shapeless round lumps. Layers of excess sulphur have become deposited on the walls and floor of the crater, if you stand on them they crunch beneath the foot like fresh snow. Some workers still smoke clove cigarettes or tobacco, to get rid of the taste left by the smelly gases. 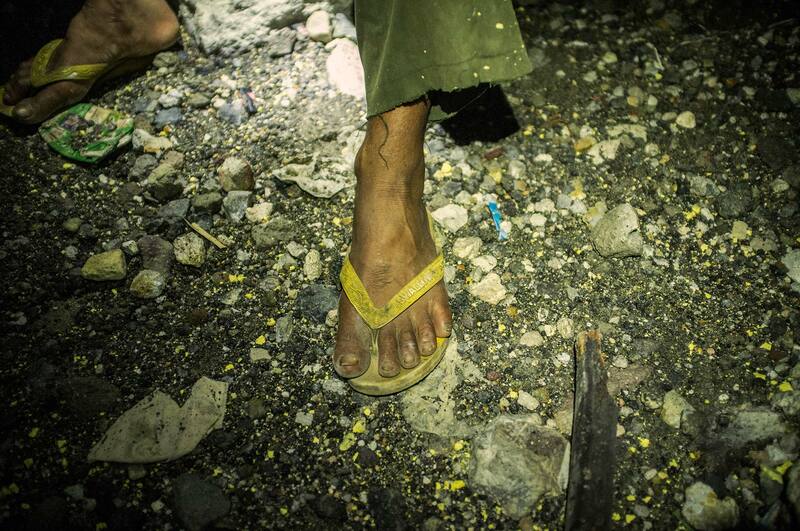 Many miners work without shoes, wearing flip-flops instead. On the way up the miners stop to rest once or twice. They put the baskets on special supports, from which they are easier to pick up again. Both baskets weigh 70-90 kg. Broken piece of sulphur mixed with volcanic mud. 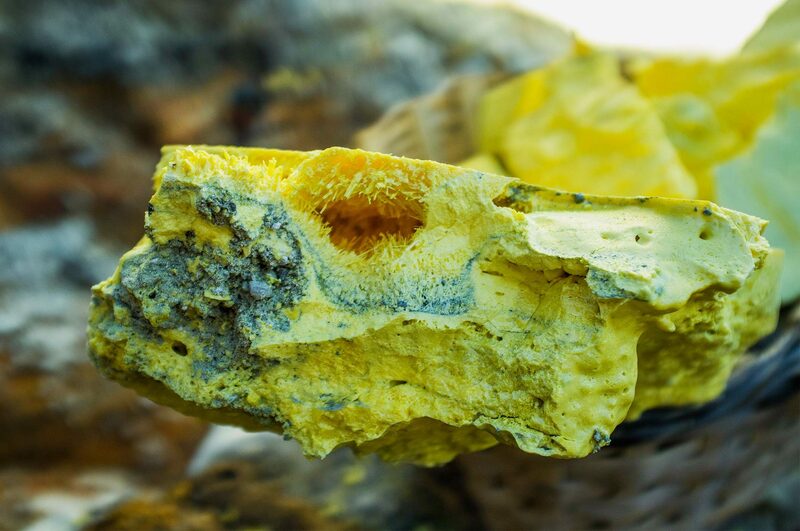 The solidified pieces of sulphur are broken into chunks and loaded into baskets which are filled to carry as much weight as the miner can manage to transport back to the weighing base. The average weight burden that can be carried by a miner up the 300m deep crater is between 60—90kg, sometimes they make this journey two or three times a day. With full baskets the miners slowly make their way up the steep slopes of the crater, occasionally stopping for a short rest or to smoke a cigarette before moving on. Some continue to smoke for the whole journey. 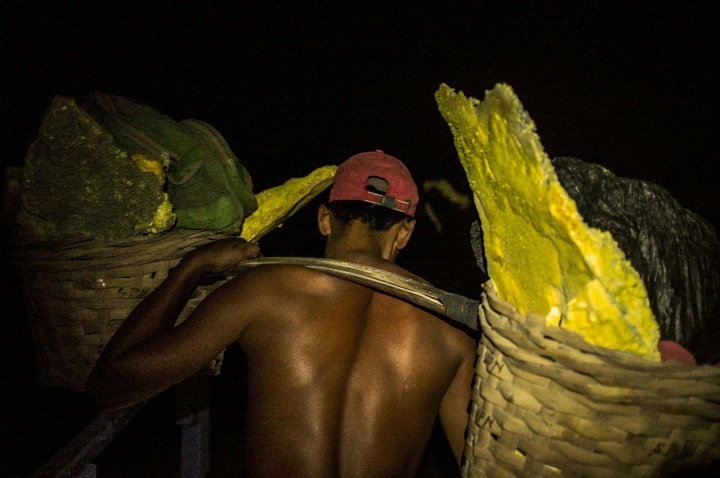 The sulphur is carried in special wicker baskets connected by a bamboo yoke, which bears the weight on the miner’s shoulder leaving him with scars over time. More seasoned miners have sometimes earned enough to purchase wooden carts to transport their sulphur loads, enabling them to make more trips up and down into the crater to fill their carts. Once satisfied with the amount collected the workers transport their loads back to the base (3km back down the volcano). 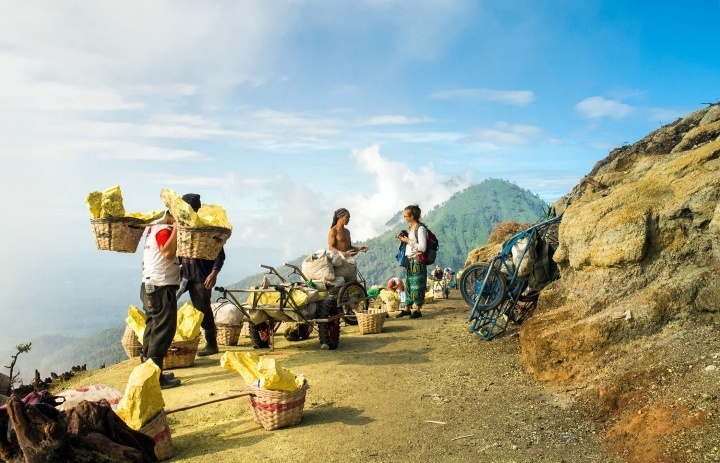 Those without the luxury of having a cart carry their wicker baskets back to the base, the bamboo yoke creaking on their shoulders as they move and small nuggets of sulphur falling from their baskets along the way. 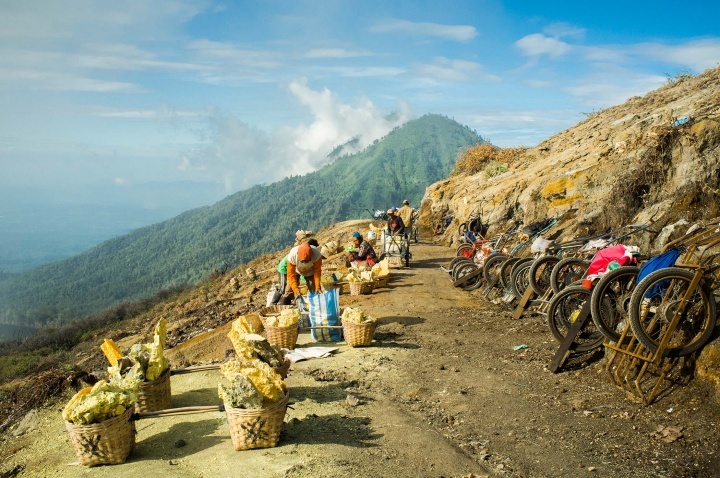 When the sulphur is weighed back at the base the miner will receive 1000 Rupiah (7.5 ¢) per 1kg, averaging out to a salary of around $5—8 per day. 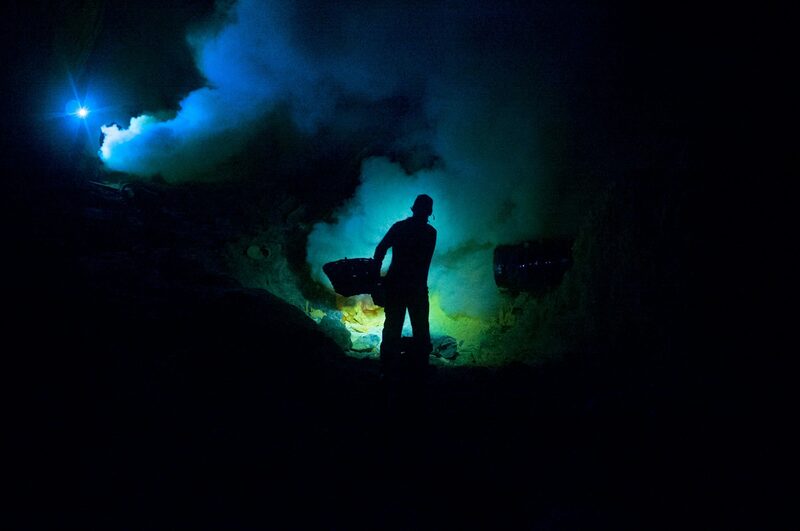 Miner ascends the crater carrying baskets filled with slabs of sulphur. 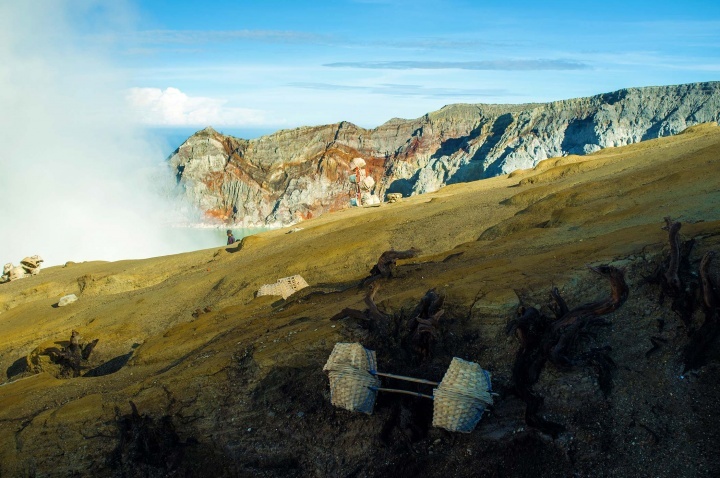 The baskets weigh upto 90kg and miners must carry these one kilometre up the rocky terrain of the caldera and another three kilometres down to the weighing base at the foot of the volcano. 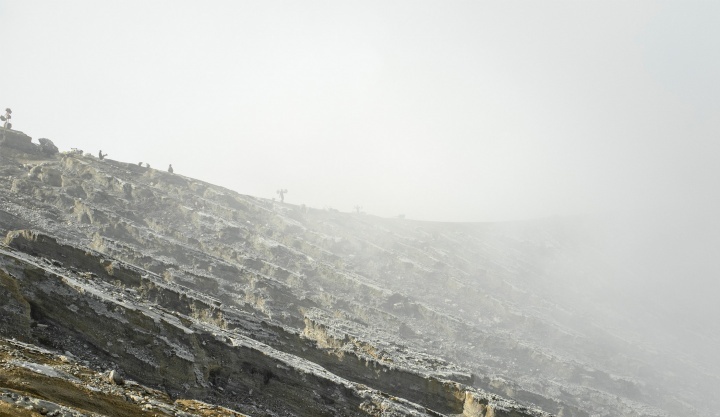 Miners obscured by smoke carry sulphur along the volcano's ridge. Empty sulphur baskets standing at the top of the crater. Miner carries baskets filled with sulphur up from the crater. 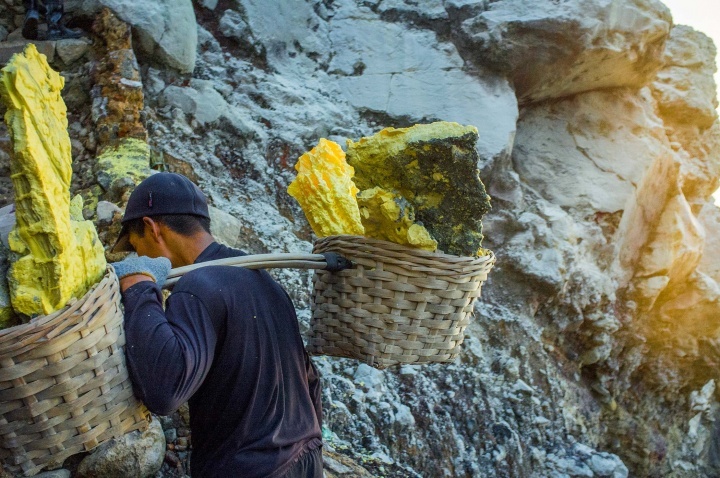 Sulphur extraction in Ijen is still a manual process and remains completely unautomated — no escalators, elevators or cranes, despite the fact that the mine has been open for some 50 years. Of course, Ijen is not the only place where you can find this chemical element, but today these Javanese miners are an endangered species. Similar mines used to exist on the volcanoes of Chile, New Zealand and Italy, but the threat of eruptions and the emergence of new modes of production led to the closure of all such mines outside of Indonesia by the early 20th Century. 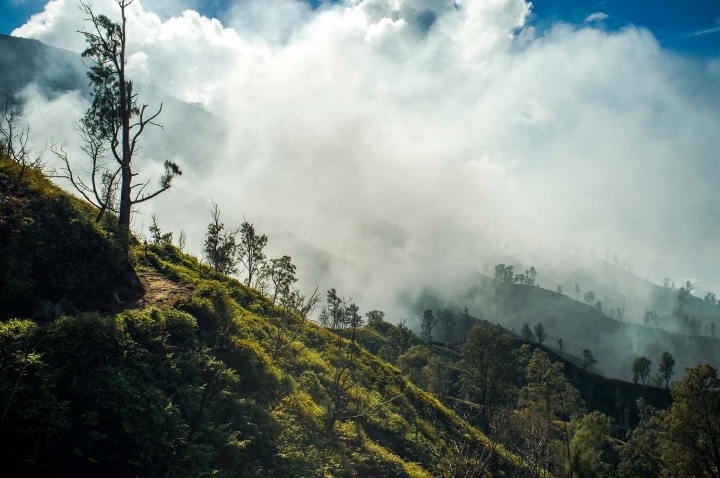 While the rest of the world automated their sulphur production process, the Indonesians haven’t invested in this change because of the impact it would have on the meagre living made by the 300 or so miners who work at Ijen. “The pay is little, but a lot more than I would earn working on a coffee plantation or in the rice fields“, said Slamet. Workers load sulphur onto carts before descending to base. The cart is worth the initial expense borne by the miner as it enables him to transport more sulphur down the volcano. Despite the language barrier between us, I still tried to ask the question of why free people volunteered to participate in this form of slave labour? My miner companion said that in addition to the obvious financial need, such work was only done for a short time in order to put money aside for family. 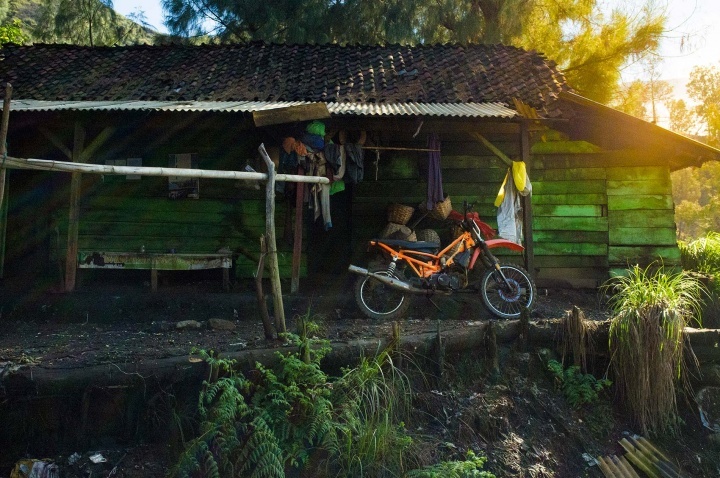 “Because of the hard conditions, this work cannot be done constantly“, Slamet explained. Stretching his shoulders out he picked up his flashlight and continued, “I work everyday. I started only recently and I need the money. Generally, people work here 4 or 5 days a week, they make enough to get plenty of rest. For this work it’s important to rest properly“. It’s true, the miners of East Java earn a decent salary by local standards, but it doesn’t save them from the scars received during their time in the mine, where they balance precariously between life and death. Life is a ticking time bomb for them, if death doesn’t catch them, then they’re likely to fall prey to burns, sores, lost teeth, persistent coughs, poisoned lungs and crushed shoulder bones. It just depends how (un)lucky they are. Men are walking on the edge of a crater. Once I had finished taking photos, I returned to my bike in the parking lot. Departing from the volcano I considered how early the miners must have to wake up to make their journey up the volcano and into the crater, and the bitter irony of how pleasant the volcano’s surroundings are compared to bleak conditions of the mine. 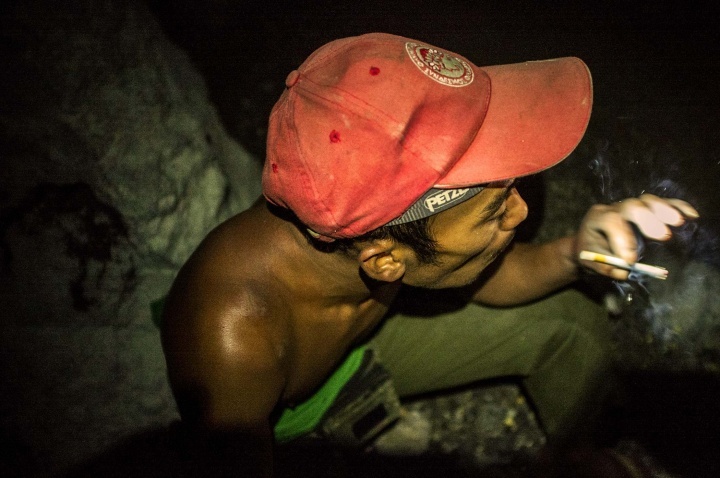 This harsh work leaves people with deformed bones, cripples their health and leads them to smoke clove cigarettes to try and mask the corrosive stink of sulphur. That smell, which clung to my skin also, is not one that I will be able to delete from my memory. It is stamped there, along with the image of a place where heavy manual labour has become a source of entertainment for visiting tourists. Why most Asians wear face masks?